This fall marks the return of many favorite characters. 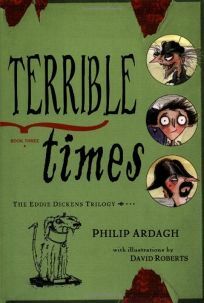 Philip Ardagh wraps up the Eddie Dickens Trilogy, illus. by David Roberts, with Terrible Times, in which Eddie, in the care of Mad Uncle Jack and Even Madder Aunt Maud (if one can call it that), sets out for America and washes overboard-will he ever cross the pond? PW said in a starred review of the series' launch, A House Called Awful End, ""Kids who lap up Lemony Snicket's series will take quickly to this tale and clamor for the next.""